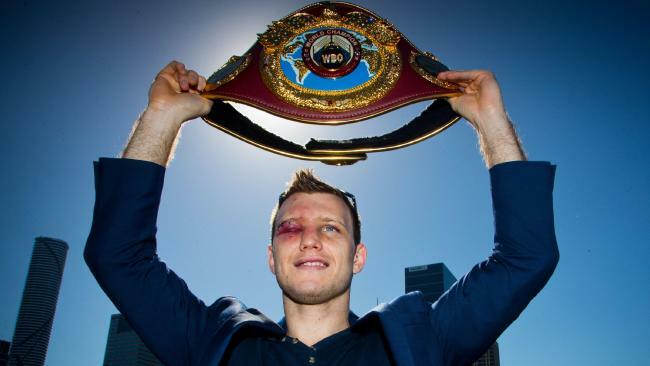 Jeff Horn with his WBO welterweight belt after defeating Manny Pacquiao. LEGENDARY boxing trainer Freddie Roach believes Terence Crawford will make short work of Jeff Horn in their title fight in June. Incredibly short work - Roach says the Brisbane-based fighter won't make it to the second round against a man many believe is the pound for pound best boxer in the world. "Horn will last one round. Horn will last one round," Roach said. Horn will be a huge underdog in his multimillion-dollar world title defence against the unbeaten Crawford (32-0) in Las Vegas on June 9. "I cannot wait to get back in the ring on June 9 and win the WBO welterweight championship," Crawford said. "Jeff Horn and his team better be ready, because they are going to see a bigger, stronger and more powerful Terence Crawford. I am going home with that belt." Roach was in Manny Pacquiao's corner when the Filipino fighter relinquished his WBO belt to Horn in one of the great upsets in Australian sporting history last July. 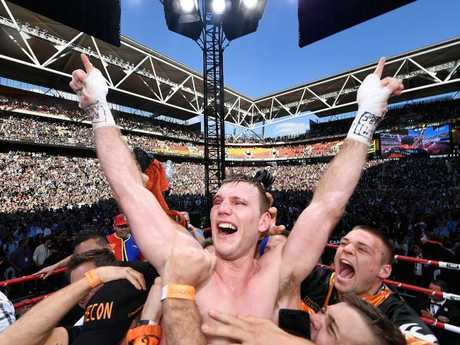 Jeff Horn is jubilant after getting the decision over Manny Pacquiao. Pacquiao has split from Roach for his fight against Lucas Matthysse for the WBA welterweight title in Kuala Lumpur, Malaysia, on July 15. But the boxing trainer hasn't given up hope of working with him again - and already has some fights in mind for the Filipino. "I would honestly like to see him fight Crawford and Horn in a re-match because I thought he got screwed in that fight," Roach said. "(He can) win his title back and call it a day. "He just had his 39th birthday, he's getting older and so forth but his work ethic is still great, he works really hard and if he comes here for the next two months for his training camp, and steps aside from the senate, he'll do fine." Last week, Pacquiao said he hasn't turned his back on Roach completely and that their 16-year association could continue in future fights. The eight-division world champion will be trained by Restituto "Buboy" Fernandez and Raides "Nonoy" Neri for his fight against Matthysse. Manny Pacquiao shares a lighter moment with Freddie Roach (L). "I am still not closing the door for Freddie," Pacquiao said. "We just want to try and experience that Buboy will handle this one fight and after that go back to Freddie. I mean if I will make a decision, but right now I didn't make a final decision yet. "Freddie and I are like a family. We're like a close family and I didn't make up any decision yet about Freddie Roach." Pacquiao frequently credited Roach for his evolution from a raw Filipino puncher into an eight-division world champion during countless hours of work in Roach's Wild Card Gym in Hollywood. But the 39-year-old Pacquiao (59-7-2, 38 KOs) has had four losses in his last nine bouts and has had a noticeable decrease in the hand speed that made him an incredible fighter. Pacquiao, who is also a senator in the Philippines, is determined to extend his career and has opted for a change this time. "My time is not done yet," he said. "That's what I am trying to prove July 15, that Manny Pacquiao is not done yet in boxing."